With a catwalk parade of dressed made with and of chocolate, Salon du Chocolat launched itself onto the London market with style. With many familiar names such as Lindt, Paul Wayne Gregory, Demarquette, Toot Sweets and more all getting involved in creating chocolate couture creations, it’s not hard to see why there was an absolutely packed audience for the launch. The Demarquette canapés I was given by Marc himself of goat’s cheese, fois gras and other delights were piled on choux pastries and topped with chocolate while their blackcurrant pate de fruits was a refreshing palate cleanser. 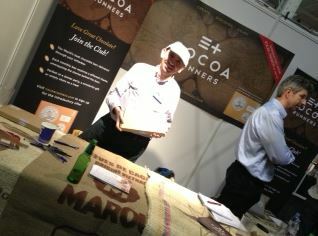 Marc’s creations also included amazing chocolates from Theobroma Grandiflorum, a relative of the main chocolate tree. These were AMAZING and so special – you *need* to treat yourself to one of these chocolates. In fact, since he no longer has a shop, visit the show to see and buy his chocolates in person. Marou brought their brand new Vietnamese chocolate which was reminiscent of some areas of Venezuela with its nutty overtimes and long finish (with just a hint of coconut). 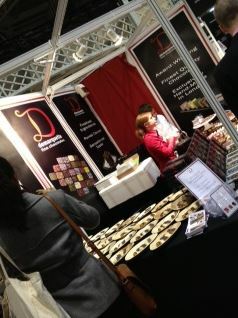 Divine Chocolate were present with a big stand showing off their delightful and rather large chocolate range. It was really nice to see them as they have always been huge supporters of the Chocolate Week events and Chocolate Unwrapped (which is now Salon do Chocolat). They were sampling the milk chocolate with sea salt and toffee when I was there alongside the dark chocolate and raspberry bar. 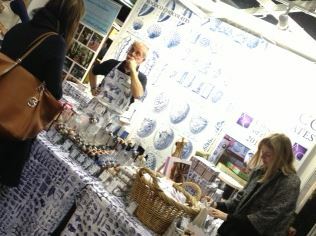 Divine were across from Rococo who were sharing a large stall space with the Grenada Chocolate Company. They had some amazing chocolates to see and taste and their head chocolatier was there chatting with all the ladies (or at least he was every time I popped by 😉 ) Rococo have been a staple of quality chocolate gifting for many years now and they have a solid following of chocolate aficionados. 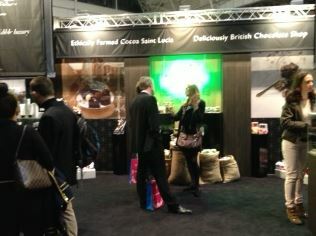 Of course, as one of the sponsors (Divine is also a sponsor of Chocolate Week), Hotel Chocolat had a rather large and impressive stand in the venue. Apparently there were also canapés from Hotel Chocolat. I was asked to mention that they were smoked mackerel with white chocolate and horseradish, chicken skewers with satay and cocoa nibs, turkey with cranberry, sage and cocoa nibs, and a Hotel Chocolat chocolate brownie. A friend with me got a certificate for a free cocoa shot at their High Street Kensington shop so she’ll be trying it out for herself on her way to visit the show properly. 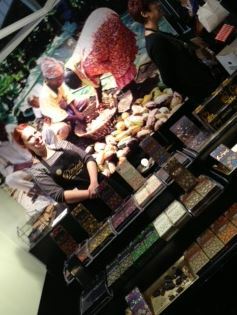 Hopefully she’ll also visit the Chocolate Museum in Brixton which has a stand at the Salon du Chocolat. They are doing lots of educational events with schools as well as educating everyone who drops by about great chocolate. Cocoa Runners were launching their new chocolate subscription service. If you’ve ever anted to get into experiencing delightful chocolate from far flung places often not available in the UK, sign up for a Cocoa Runners subscription. Not only is it a great gift, it’s perfect for yourself and some wine – have your friends over and do your own monthly wine and chocolate pairings. You bring the chocolate, they bring the wine! While I may not have seen the show, I did get the chance to see a few of the dresses close up and in person. This was the one I wanted to see the most – the steampunk dress created in collaboration with Toot Sweets with designer Hannah Wilkins-Webb creating the final look. Her salted caramels are divine so buy one while you visit Salon. Rip off price. Very weak , I and my friends will not be going again. I’m sorry to hear you felt that way. I thought it was an excellent chance to buy and try chocolate from French chocolatiers as well as get your hands dirty in a few workshops which were happening through the day. I saw a number of chocolatiers had samples on offer and really – you’ll have to go to France to buy from them now. The main Salon du Chocolat in Paris is much larger, longer and has 19 years behind it. Perhaps next year it will be bigger but for their first year, with all the workshops and the many French chocolatiers, I felt that (especially compared to Chocolate Unwrapped which it replaced) it was good value for money. We have just come back from Paris. 10 times the size of London, better chocolatiers there and entrance fee of less than half Londons price.